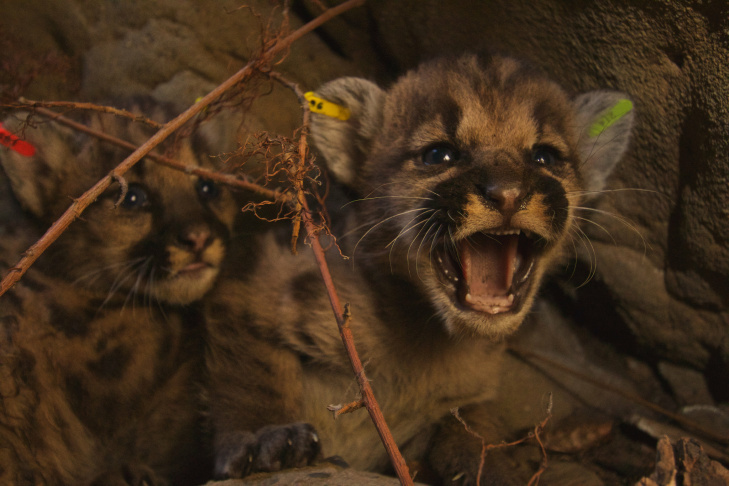 Researchers in the Santa Susana Mountains discovered two litters of mountain lion kittens in June. 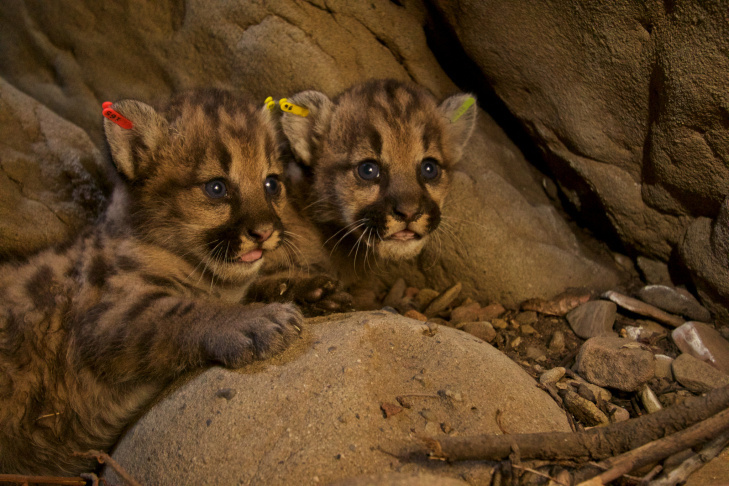 These mountain lion kittens are two of five discovered in June by National Park Service researchers in the Santa Susana Mountains. Two litters were discovered with three females and two males. 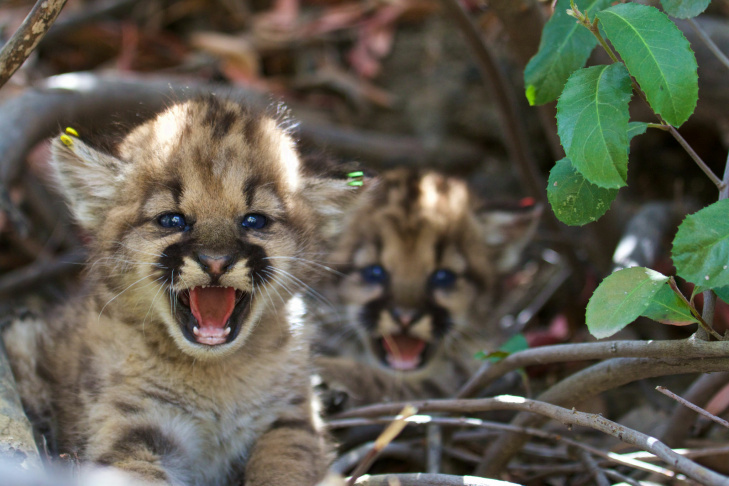 National Park Service researchers discovered two litters of mountain lion kittens in the Santa Susana Mountains in June. The Santa Susana Mountains have five new residents, and their cuteness factor is a welcome distraction from news of email scandals and war. National Park Service researchers discovered two litters of mountain lion kittens last month, making them the 10th and 11th litters to be tagged at a den site. The first litter discovered June 8 includes two females whose mother is 6-year-old P-35, according to a statement from the National Park Service. The second litter — one female and two males — was found in a cave-like area hidden behind boulders on June 22. Their mother, P-39, appears unimpressed by the camera spying on her hidden haven in the video below. Researchers believe both litters are fathered by P-38. The male mountain lion was observed spending a lot of time with both P-35 and P-39 months before the kittens were born, according to the park service. A paternity test is underway to confirm the identity of both litters' father. It's not unusual for male mountain lions to mate with multiple females at the same time. In Southern California, that can spell trouble for lions locked into narrow ranges by freeways and human developments. Males often end up breeding with their daughters and even granddaughters, making the Santa Monica Mountains National Recreation Area's already small population genetically less diverse, park service biologist Jeff Sikich told KPCC. In this case, however, researchers are confident P-38 is not related to P-39 or P-35. That's good news for the animals. Another plus is that the females are not related to each other. "We see this frustrated dispersal: lions are pretty much trapped in this island of habitats by freeways and development. 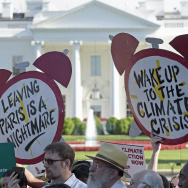 They really have nowhere to go, and eventually they run into the adult male," Sikich said. The leading cause of death for mountain lions is other mountain lions — specifically adult males killing young males trying to disperse, Sikich said. 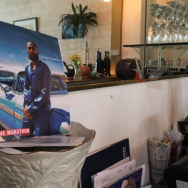 "In the 14 years we've been doing research, we've only seen one successful dispersal from north of the freeway south into the Santa Monicas, so we know the 101's a major barrier," Sikich said. The Santa Susana Mountains, where the kittens were discovered, are a part of the wildlife connection between the Santa Monica Mountains and the Los Padres National Forest — a fact that Sikich said is important, since researchers are interested in how these animals are moving and surviving in an increasingly urbanized landscape. 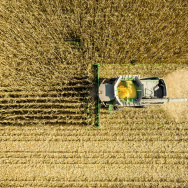 An effort to create a wildlife corridor, which Sikich said would ideally be a vegetated bridge over the freeway, has been underway for some time now. The National Wildlife Federation has been working in collaboration with partners like the Santa Monica Mountains Fund to advocate for the corridor. A video rendering of the design for the Liberty Canyon Wildlife Corridor shows how the pass would create a space for animals to move from one side of the freeway to another. The estimated cost of the project is $55 million. This is not the only wildlife corridor the region has in the works. 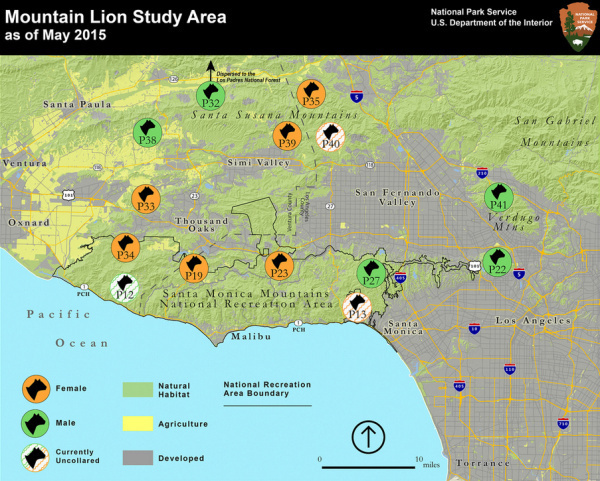 In April the L.A. City Council voted to create an ordinance that requires building permits to meet criteria to protect a different wildlife passing in the eastern Santa Monica Mountains. According to the L.A. Times, that passing encompasses the areas between Griffith Park and the 405 freeway. Correction: A previous version of this story conflated two separate wildlife corridor projects. KPCC regrets the error.